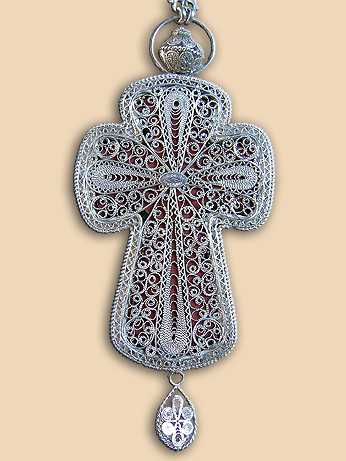 Pectoral cross in silver filigree in pair with panagia PN006, which can be seen HERE. Technique: filigree, granulation, egg tempera, guilding, icon-writing (Sister Porphyria, Zica Monastery) 2008. 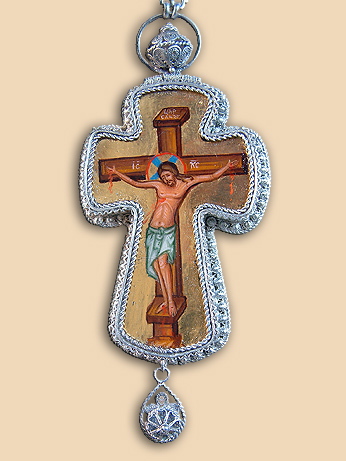 Size: cross 7,5 × 12 cm., silver chain 140 cm. Weight: cross 50 grams., chain 65 grams. Commissioned by: Mother Superior Helen (Lazovic), Abbess of Zica Monastery. In possession of : His Grace Atanasios (Jevtic), retired Bishop of Zahumlje and Hertzegovina.